This entry was posted on	October 4, 2016 at 12:17 pm	and is filed under Uncategorized. I haven’t seen Stanley’s response. Do you have a link to that? I would imagine that he would like to walk this back a little. He was trying to make one point, and ended up creating a much bigger controversy. Walk it back? He doubled down! Thanks. I’ve read it through once, and it’s helpful. I’ll look more deeply later. My own experience with Andy is only “online”. Love his sermons. What I can say is that while he may not use “because the Bible tells me so” as authority, he does preach directly from it, thereby conferring authority. The last 6 minutes of Message 6, which he directs us to is a great example. I thought he might want to walk his view back a little, but I find his defense refreshing. As long as he uses the Bible as the source of authority, I don’t see a problem in directing our attention to the message as relevant today. Don’t keep up with Stanley. For that matter, don’t pay much if any attention to Mohler. Would say… when it comes to actually moving the gospel forward, the nod goes to Stanley. Will also say, when it comes to actually representing the gospel with fidelity to Scripture, the nod again goes to Stanley. Hard to take Mohler seriously given that his fundamentalist proclivities which greatly hinder his ability to see anything in Scripture that he is not predisposed to find. I think Stanley’s point is that the Apostles and other first century Christians didn’t read about the resurrection, they were there and they lived it, and then later they preached it and wrote about it. An (…the! 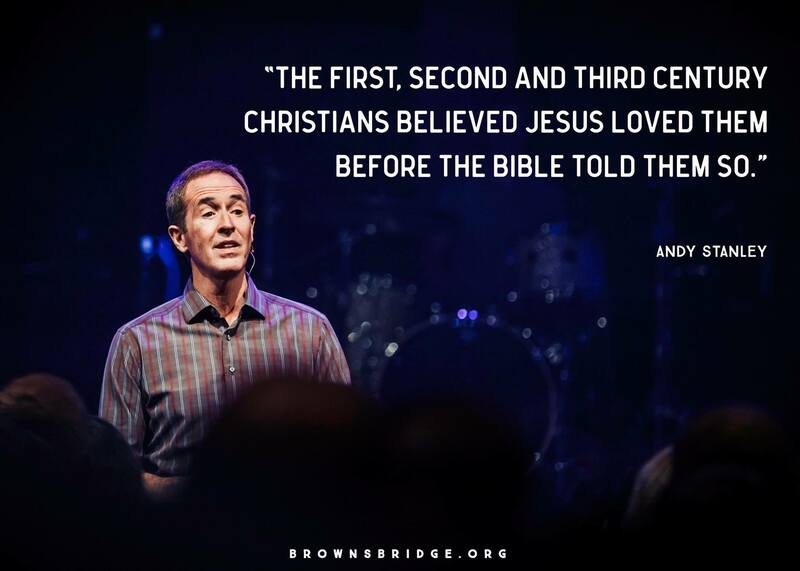 !…) essential point of Christianity is that the core events happened in history, yes? That the resurrected God is really real and really walked around and talked with people right there in downtown Jerusalem. That seems unproblematic theology, although it’s not a message that gets preached much these days. I would have thought that was a liberalist issue, avoiding the tender toes of the Jeffersonian rationalists. I get his point, but the way he arrives at it is misleading. The apostles always had scripture. Find a sermon in Acts that doesn’t draw upon it. It was never enough for the apostles to say, “We were eyewitnesses to the resurrection, so you can trust us,” without also citing scripture. It was always both/and. Stanley said he got to the Bible later in the series—just not in this first sermon. I don’t know how I feel about that… That is neither a traditional nor biblical picture of what church is supposed to be. This is why I’m curious about Stanley’s pneumatology. He and his very clever staff shouldn’t be doing most of the work of winning souls. Feels too much like marketing. “But it works,” a Stanley apologist might reply. Yes, but what is the “it” that’s working? Joel Osteen and Creflo Dollar have very large churches, too. That doesn’t prove anything. Nevertheless, I thought the author I cited in the post put it well in his rebuttal. Personally I believe that small face-to-face churches is where Christianity happens. Megachurches, denominations, and TV/internet preaching can be useful aids but they don’t altogether do the job. True that the Apostles were (mostly?) raised as Jews, but the crucible of Christianity was the inspiration of the Gentiles in the first century, and the audience for the Gospels were so ignorant that it had to be explained to them that Jews washed their hands before eating (bizarre custom!). Paul’s churches had a literary tradition, but no canon, and there were also heretical documents circulating, such as Thomas. A reliable, generally accepted library telling the Jesus story didn’t emerge until the 2nd c. at least, and it grew out of lived experience. It wasn’t even obvious to the Apostles that the Messiah they got was the same as the Messiah anticipated … Jesus had to explain it to them on the was to Emmaus. That’s my take anyway. Personally, the reason I confess is from the word written on my heart and in my life; Scripture is precious to me because it reflects and expands on that Word. Did I mention, like those first generation guys, I wasn’t raised in the church. Brent, I agree with you and Kruger; and, as he is being presented, am disappointed in Andy. I like what you say also about, “What is ‘it’?” Big crowds followed Jesus at first, but dwindled down considerably once the “hard sayings” came along. Of course scripture is vitally important. Jesus cited it all the time and considered it authoritative. He also said, “My words will never pass away.” So, where do we get those “words” from? The Scriptures. Okay, since we’re still going on about this, consider the following question. If a devout Christian (maybe even a preacher) was dropped into group of people, who had never heard of Jesus, in a remote location, and he didn’t have his Bible, could he preach the Gospel of Jesus Christ? Well, clearly “Bible in hand” is necessary. However, that does not mean “Bible in mind” is unnecessary. While “literal words” are not necessary, the basic biblical concepts of God’s existence, sin, repentance, Christ’s death in our place have to be communicated. The only place that we get those from is the Bible. So, I “stick by my guns” that “the Bible” is essential to Christianity and its propagation and guidance. Okay. You are obviously very invested in this, so I’ll let it go. I just don’t think that you are seeing what Andy is trying to say here. I just finished listening to the whole series and I wasn’t uncomfortable with any of it. I was thinking more about your comment on pneumatology, and it occurred to me that for evidence of the Gospel, besides the Bible we have the transmission of the faith directly from person to person for 2000 years in an unbroken lineage from the Apostles to you and me. Which is how we get the Spirit to read the Word properly. I agree that aspect gets pretty much neglected, even deprecated as “enthusiasm” sometimes. Stanley doesn’t go there in this series.